In the last lesson of Astro 101, I introduced the astrological houses. If you missed that blog post then I encourage you to read that before you continue with this lesson. Also, you can read all the lessons from Astro 101 by simply going to the resource page I created to keep everything nice and organized. In this lesson, we are going to move on to something new the hemisphere orientation of the houses. One of the main things to remember about astrology is that it’s all about numbers. In past lessons, we learned that there is one chart, two genders, three modalities, 4 elements and all of this components combine together to become the twelve signs of the zodiac. While we are learning about the astrological houses, you will notice this pattern continues. Imagine, if you will, that the chart is a pie (who doesn’t like pie). You can divide a pie in two different ways – north to south or east to west. Similarly, we can divide the chart from north to south or from east to west. In earth science, these are considered hemispheres. Astrologically, we refer to them as hemispheres as well. Each hemisphere of the chart has unique qualities or characteristics that are attributed to them. Planets that are placed in hemispheres will express themselves based on the hemisphere they are in. This will modify the way they ‘act’ based on their environment. This entry was posted in astrology and tagged astrology, Hemisphere Balance on July 25, 2018 by Storm Cestavani. Did you know that every relationship you have or will EVER have is found in your horoscope? Your parents are found in your chart, your love relationships, your pet, your doctor, your educators, your friends, your siblings, and even that ONE person you wish wouldn’t be in your chart is THERE. IF you didn’t know this, then this lesson is definitely for you! In my last teaching series of Astro 101, I explained the astrological signs. We learned about astrological gender, elements, and the modalities that form the 12 signs of the zodiac. In this series, we will explore the astrological houses which will help prepare us for our study of the planets. I remember when I first started studying astrology (1984) that I found astrological houses confusing. At that time there were few resources a teenage boy could get in upstate New York – just the random books that could be found in the library. I understood the signs as they were descriptors of how the planet is going to perform; yet, the houses were baffling to me. Eventually, I took a high school psychology and learned about projection. Then the houses began to make more sense to me. The houses were areas of our life and our relationship with the outer world from the front porch of our Ascendant (imagine yourself sitting in a chair at your Ascendant look out at the rest of the houses). So, every house has an innate expectation that we have projected upon in since birth. Simply put, the signs are seasonal in nature, and they occur simply because the earth moves around the Sun and is measured in 30 degree increments. The Sun begins its each year (beginning of spring) in the sign of Aries and ends each year in the sign of Pisces (end of winter). On the psychological level, the sun moving through the signs reflects birth-growth-death-rebirth cycle that is inherent in the seasons and all of life. The houses, on the other hand, develop spatially because of relationships. In the 1st house one develops self-awareness in relationship to themselves, the 2nd house we develop a relationship to money, and around the wheel we go creating relationships with individuals and groups until we experience our larger relationship with the collective in the 12th house. Additionally, since the houses reflect our relationships with others, they are reflections of who we are ourselves since we will project the contents of our personal chart onto the people around us. The purpose of astrology is to bring our projections back home to the Ascendant, which makes us more well-rounded individuals. Here is a quick list of the astrological houses and the relationships that exist within them. Of course, I will go through them more thoroughly but this gives you a jumping off point to start playing with your own houses. 12th house Relationship to the collective unconscious, dreams, myths, ancestors, and the hidden worlds. On a piece of paper making a list from 1-12. Write down the sign on each of the houses and any planet that may be in the house. This will give you a bit more grounding in your own chart and an idea of what to look for interpreting your own houses in the sections to come. 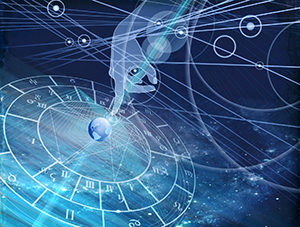 This entry was posted in astrology and tagged Astrological Houses, astrology on July 25, 2018 by Storm Cestavani. Welcome back to Astro 101. We have already covered gender, modality, and elements. 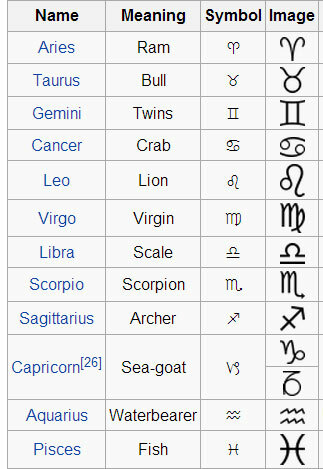 Now we are going to put them all together, which will give us some information about all the astrological signs. The element of fire consists of three signs – Aries, Leo, and Sagittarius. Fire is concerned with potential and possibilities. It is deeply intuitive and focused on what ‘could’ be rather than what is. In fact, ‘what is’ is very mundane and boring for fiery types, and they attempt to avoid reality as much as possible. This isn’t because the physical world is too much for them to deal with; it’s because the magical kingdom with dragons, prince and princesses, and a glamorous tomorrow is more palatable. If positively expressed then fire is spontaneous, intuitive, creative, and magnanimous. However, if fire is burning a bit too bright or is negatively expressed it can be egotistical, impatient, compulsive, and reckless. The element of earth consists of three signs – Taurus, Virgo, and Capricorn. Earth is the element that is concerned with concrete reality; the things that you can see feel and touch. Earth is deeply sensual and often enjoys the finer things in life. So, they are more than willing to get out the checkbook and spend big if it is on something they find beautiful or gives them pleasure. Since earth is based on the ‘real’ world (whatever that is), it is often annoyed by speculation and risk-taking. It likes to take the tried and true road because it is safe and secure, and they deeply fear to risk everything for the sake of momentary adventures. If positively express then earth is practical, dependable, serious, and enduring. However, if earth is too bound to material structures then it is stubborn, rigid, materialistic, and inflexible. The element of air consists of three signs: Gemini, Libra, and Aquarius. Air is the element concerned with ideas. It rules the mind and everything that goes with it. Air is concerned with putting things together into a strategic formula so that life is civilized, fair, and decent. This element is the most connected to humans and its three signs are represented by symbols that are the most disconnected from the animal kingdom. As a result, air finds emotions suspect and often used as a tool of manipulation and will detach themselves from these experiences if pushed. This can lead to strained and difficult relationships. If positively expressed air is mental, intellectual, communicative, and social. However, if air flies up too high or is too detached from their emotions it can be wordy, gossipy, detached, and inconsistent. The Element of Water consists of three signs – Cancer, Scorpio, and Pisces. Water signs are the most elusive of all the elements and they thrive on emotions. This means that relationships and connection to other people are highly important, and isolation and loneliness can be quite overwhelming. They deeply fear to be alone and will often compromise their personal happiness to keep others close. Although ideas and concepts are important to water signs, they will often feel that talk is cheap and that actions trump words. If water is expressed positively then it is nurturing, emotional, receptive, and protecting. If it is expressed negatively it can be overprotective, fearful, insecure, and dependent. Need answers to life’s pressing questions? You can contact Storm for a reading today! 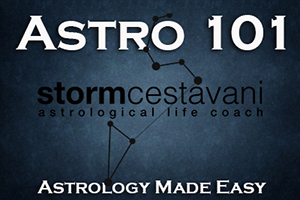 Astrology 101 is an exclusive product of Storm Cestavani and Storm Cestavani, LLC. All rights reserved. This entry was posted in astrology and tagged Aquarius, Aries, astrology, Cancer, Capricorn, Gemini, Leo, libra, Pisces, Sagittarius, Scorpio, Taurus, Virgo on July 25, 2018 by Storm Cestavani. In our last lesson we learned about the astrological elements (fire, earth, air, and water) and now is time that we move on to the third ingredient to prepare for interpretation which is the astrological modalities. Have you ever wondered why a Libra does not respond to life exactly the same way as an Aquarius? How about Leo and Sagittarius? There is a reason for this – every astrological element (fire, earth, air, and water) are divided into three subsections. These subsections are called cardinal, fixed, and mutable in astrologese (that’s the language astrologers speak) and these subsections represent the modes or quality of a sign. In essence, they represent the way that the sign orients itself to achieve something in the outer world. As I stated earlier each of the three elements are divided into three subsections. These three subsections have different ways of manifesting the elemental qualities of the three signs that exists within each element. In each case, the natural energy of the element remains the same. All three of the fire signs seek to find potential and possibility and keeps its eye on the future, all three earth signs seek stability and like to create concrete structures in order to manifest life concretely, all three air signs seek to find meaningful patterns in order to perceive in a logical manner in which everything follows a system or pattern, and all three water signs seek to find meaning through its relationship with others and its tribalistic connection to an honored past. However, each of the three signs achieve results in vastly different ways and a signs modality describes how the sign is going to take action. The cardinal signs are the go-getters of the zodiac. They love to start things up and get things rolling. In the Jewish or Kabbalistic tradition, the world was created while the Sun was in the sign of Libra. On day one (or 1 degree of Libra), the Hebrew Yahweh created the heavens and the earth and the process of creation began. The cardinal signs are the ones that come up with all the wonderful ideas and are constantly in a state of creating, but unfortunately they often do not finish the projects they begin because they are quickly moving after the next thing. They are natural leaders and they are often the instigators of action in the world. However, when the cardinal planet is not working properly or operating from the shadow, they can be controlling, impatient, forceful, and conniving. The cardinal signs need to realize that although they may create the most perfect mold, it is necessary to let the cement set in order for a structure to have a solid foundation. The fixed signs are the ‘stubborn’ signs of the zodiac. They do not like to be pushed around and if you try to force them to do anything, you will find yourself in a pitch battle that you will most likely lose – that is unless you are fixed yourself and then you have achieved the classic ‘stalemate”. Planets in the fixed signs are stable, like to get things done, and love to complete projects. Whereas, cardinal signs like to begin things they often leave the fixed signs to manage them. Fixed signs have enormous endurance and can often patiently wait for things to occur or manifest; whereas, the other modalities may have either moved on to the next thing or given up hope out of boredom. However, this stabilizing quality of fixed signs often leads to rigidity and once a habit is formed it’s difficult to get them to let go of it. 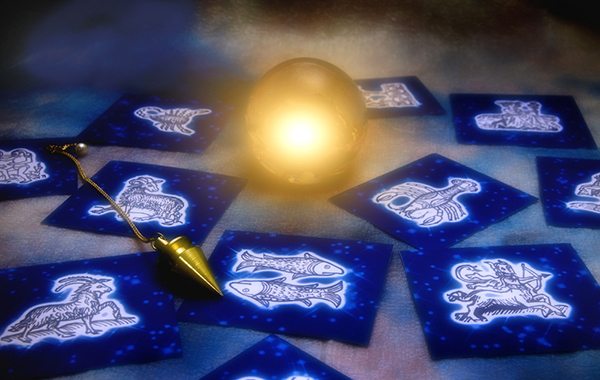 Fixed signs like to feel established and are very determined to achieve their goals. However, when the fixed planet is not working properly or is operating from the shadow, they can be obstinate, resistant to change, and their internal growth becomes stifled because they often stay stuck in their circumstances. It is necessary for fixed signs to realize that although having a stable foundation and reliability are great qualities to have; sometimes, one must allow change to occur in order to stay with the times to foster future growth. The mutable signs like to remain flexible and keep all their options open. 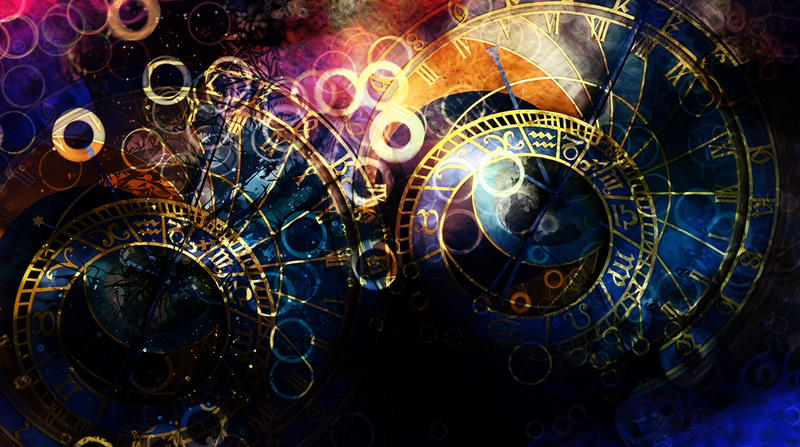 Unlike cardinal signs that like to get things rolling and fixed signs that like to manage things, mutable signs like to remain interested in anything that they are interested in – and usually a lot of different things are on their never ending menus. If mutable signs become disinterested in something they will often find something else that catches their attention and move on to it quickly without any regret. Out of all three modalities, mutable signs are the most adjustable and adaptable to circumstances or situations. They welcome change in its variety of manifestations because change is interesting and the last thing a mutable sign wants to be is bored. Mutable signs like to avoid strife because conflict requires mental effort which mutable signs would rather use on things they may enjoy. Mutable signs like to be flexible, versatile, and malleable. However, when the mutable planet is not working properly or is operating from the shadow, they can be scattered, unfocused, distracted, and restless. People with a majority of mutable planets need to realize that life is about change and adaptability, yet sometimes it is necessary to take charge and formulate decisions in order to find solid meaning in life. Although mutable signs are the classic “jack of all trades”, they often make the mistake of never being a master of anything. In our last lesson, we added up the planets to find out which element dominated the horoscope. It might be beneficial for you to review that lesson once again. 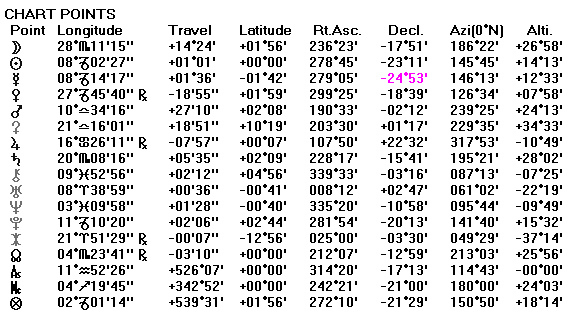 We will do that again for the modalities – here is a cheat sheet for the astrological glyphs if you need them. I will list them out for those who are not familiar with the glyph symbols. 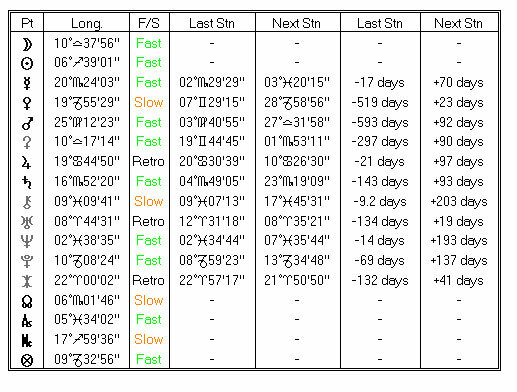 Here is a list of all the planets currently in the heavens at the time of this writing. The current astrological planetary positions are overwhelmingly cardinal. Someone born on this particular day (and I am sure that many babies were), leans towards being an initiator and go-getter. Goals will be achieved by going out into the world to make things happen. They are natural leaders, inventive, and will take charge of a situation or circumstance if given a chance. However, with both fixed and mutable planets deficient, it may be difficult for them to sit around and watching things develop, and they may experience difficulties communicating their ideas effectively because they have an adverse relationship with change. It will be necessary to develop patience and malleability to achieve the far-reaching success desired. Activity 1: Get out your own chart. Use the instructions above and generate your own personal profile. What modality dominates your chart? Which modality do you have the least number of planets in? This entry was posted in astrology and tagged astrology, Cardinal, Fixed, Mutable on July 25, 2018 by Storm Cestavani. In our last lesson we learned about gender in the horoscope (introversion and extraversion) and now is time that we move on to the second ingredient to prepare for interpretation which is the astrological elements. Additionally, everyone can get a copy of their horoscope which you can get for free on my website. If you do not understand the chart, you can always check out the tutorial that I created to help you understand your horoscope. Although many in the psychological field want to credit Jung with the foundation of the psychological types, it is in fact a system that has more classic roots. If one studies the works of Plato or Sicilian philosopher Empedocles one gets a whiff of a system that is much older than our modern lens and even ancient alchemists dipped their feet in the ambiguous world of matter. 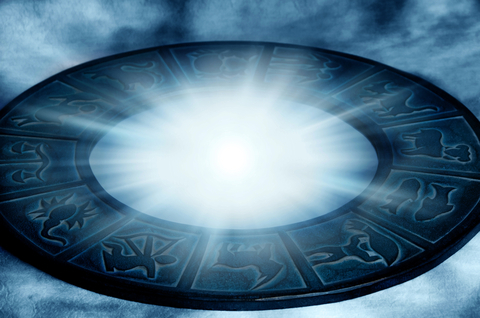 Astrologers have also used a “system” of types for over 2,000 years and they were referred to as elements – they are fire, earth, air, and water. So, what are these mysterious elements that ultimately lead to Jung’s typological map? Kim Rogers – Gallagher says the following about the astrological elements in her book, “Astrology for the Light Side of the Brain”. Although Jung did not originate the concept of elements, he did extrapolate them and make them understandable through a psychological lens. Jung felt that the functions (elements) reflects a particular mode of perception that would allow an individual to understand life through his conscious mind. Now, before we go further — Jung’s functions were not mean to be a form of “typecasting” or “profiling”. In fact, Jung believed that our “type” changed over time as new material is integrated from our unconscious into our conscious mind. (In Astro 201 we will learn an astrological tool called progressions which is a great way to explain Jung’s ‘change over time’ belief). However, we can translate Jung’s typology into astrological language. Thinking becomes air, feeling becomes water, sensation becomes earth, and intuition becomes fire. Like all Jungian theories, typology can be extremely dense and takes a bit of consideration in order to understand its complexities. Let me break it down for you. In our last lesson, we added up the gender polarities to help ascertain whether someone leans more introverted or extroverted. It might be beneficial for you to review that lesson once again. We will do that again for the signs – here is a cheat sheet for the astrological glyphs if you need them. I will list them out for those who are not familiar with the glyph symbols. Below is an image to show you the grid I am using. Based on the current planetary standings, the energy leans more towards introversion and dominated by water planets. Activity 1: Get out your own chart. If you do not have a copy you can get one for free on my website. Use the instructions above and generate your own personal profile. What element dominates your chart? Activity 2: Get out your own chart. Which element dominates your chart? What is your opposite element? For example, if Water (Feeling) dominates your chart as it does in our example, then the opposite or shadow element is Air (Thinking). 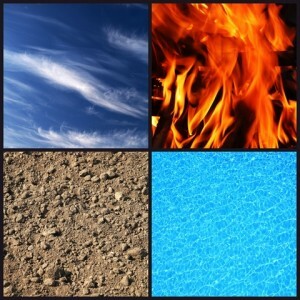 Now, let’s go through the four elements. I decided to start with the most difficult to understand first. The element of fire corresponds with Jung’s idea of intuition. However, in modern pop culture, the word intuition is highly charged and is defined as anything from a “gut feeling” to “precognition and mediumship” – many of which would be more appropriately defined as perceptive. Fire signs, though, are not necessarily motivated by talking to the dead (although some may be) or being overly sympathetic and emotional, they are more concerned with potential and possibilities. In mythology, the element of fire is assigned to the gods. It is volatile, imaginative, uncontainable, and separated the godhead from mere mortal flesh. The most famous story, of course, is Prometheus stealing fire from the gods and giving it to mortals. Zeus has a fit and punishes Prometheus to hang off a mountain for eternity having his liver eaten out by an eagle. For the gods, worship by human beings is intrinsic to their survival. If humans could envision the future and/or experience insight (all fiery qualities), then the worship of deities (that are really not concerned with the plight of man) would become irrelevant. So, what is this potent thing we call fire? Simply put, it is the power of the imagination. Fire is our ability to look into the future and hope for tomorrow, and all three of the fire signs have copious amounts of this inspired vision. You can find them everywhere using their creative powers to make the world a better place (which can often be as ill-conceived as any other vision). However, if the fire signs blaze has been snuffed out, it tends to smolder, is often angry, and can suffer maladies such as depression and apathy. The biggest difficulty with the fire signs is that they have problems with physical reality. The world of rules, responsibilities, and structure are rather dull, banal, and boring for the fiery types. After all, fire cannot be contained and when it is trapped it will often burn itself out. Fire needs to be free in order to envisage a vast world of colorful creations in order to tap into their own unique style and purpose. Being ordinary is not acceptable and when one is entrusted with the element of the gods; it should be taken seriously. The element of earth is the most tangible. We can see it, feel it, touch it, smell it, and taste it. It’s connected deeply to our senses and Jung referred to it as the function of sensation. The world of earth and its signs represent the material world. It’s our banking institution, our values, the rituals we do on a daily basis, our career, jobs, and our position in the world. Earth is the skin we wear that protects us from external influences and allows us to adapt to the physical world and survive. Earth signs are motivated by what they can achieve and what is accomplished after hard work is performed and these industrious signs will work endlessly to achieve their goals. In mythology, the element of earth is symbolized by the Great Goddess. The Greeks called her Gaia and she represented the laws of nature and physical reality. She presides over the seasons, time, life, and eventually death. As human beings became more advanced, the worship of Gaia eventually became more humanized and morphed into the worship of her daughter Rhea and eventually her granddaughter Demeter (we will meet her when we study dwarf planet Ceres) who presided over the Eleusinian Mysteries. In the age of Judea Christianity, much of the worship of the cycles of time have been discarded by more fiery ideas of everlasting life and the redemption of the soul through faith, yet as much as we try to run from her domain, the goddess always (one way or another) comes to claim us. Earth is what provides our lives with structure and foundation. You can find them thriving in the financial world, business management, pet clinics, and in our agricultural fields. 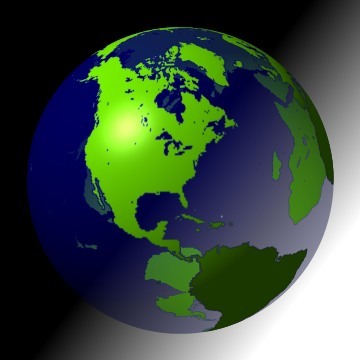 Individuals who are dominated with earth have a need to actualize their desires in concrete form and tend to avoid areas of life that are “iffy” or based upon random speculation. If earth is not working properly within a horoscope, then problems with the body and health can begin to occur and in many cases blind fanaticism can erupt from their unconscious forcing them to form allegiances with curious bedfellows in order to feel grounded and stable. The biggest difficulty for earth is the world of the irrational and intangible. For earth, if you can’t use one of your senses to experience something then it simply does not exist. 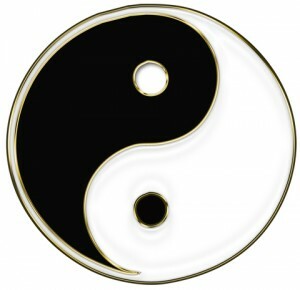 However, this creates a black and white construct of the world, which often lacks color, originality, and spontaneity. Many later in life, often look back at a life that has been unlived and replaced by the pursuit of the physical which leaves one wanting more of the physical in order to feel accomplished. Earth needs reality and its ability to cope with the world is admirable, yet in order for earth to feel fully complete it needs to couple reality with inspiration and success to achieve individuality. We move out of the world of the imagination and the physical realms and land smack in the middle of the vast fertile land of ideas which is what the air signs are all about. You see, they dig communication, education, understanding, and most of all sharing their ideas and opinions with others. The fastest way to drag an air sign down is to eliminate their freedom of speech and you strip them of their capability of relating to others. In mythology, if one wants to breathe in the freshness of the airy realms, one only needs to look towards the heavens, which is the home of God or the mountainous realms of Olympus where the 12 Olympians Gods decree their will upon more chthonic mortals. Of the 12 Olympians, the daughter of Zeus, Athena, is the most humanized and represents the power of mental prowess and diplomacy. She is the goddess of Justice of the mental and cerebral worlds and it is through her domain that we have evolved into democratic societies with legal systems that are just and appropriate for the offenses committed. Further, through the Orestes myth, she formulates the first human jury – where an individual is judged by his peers rather than by the systems of authority alone. In essence, Athena represents progress. The progress of the human mind as it acquires knowledge and experience then applies it to everyday life. Air represents the human mind which has the capacity to learn, think, and reason. It’s responsible for all those groovy and cool electronic devices that you have scattered throughout your house. Every time you make plans, create strategies, come up with that brilliant idea, or sit around in conversation with friends you are using the airy functions. In addition, air provides us with our capability of having relationships with others. The difficulty for the airy realms is the world of emotions. They are messy, sticky, and overly connected to the instinctual realms. They can be overwhelmed by emotional outbursts or covert moods which air finds manipulative, controlling, and uncivilized. Although relationships are in the airy domain, this is an arena of great difficulty for many air signs because relationships require emotional connection and empathy not problem solving and rationalizations. At times, this gets air into enormous trouble because those of a more sensitive nature might feel undervalued or ignored. Although air needs the rational intellect, in order for air to evolve and live a more rounded life they need to embrace their feelings and primal connection to their roots which ultimately matter more to them than abstract ideas and concepts. The element of water is magical, mythical, destructive, monstrous, and redemptive. Jung referred to water as the function of feeling in his typological system, and astrologically water refers to the world of human emotions. Water loves to feel – in fact it thrives on it. Water signs are usually found in the helping professions and doing good charitable works because it helps them inwardly feel connected to the human condition. They become connected to all of life which is the primal waters that the cold blooded creatures that represent the water signs crawled out of. In Mythology, water deities are elusive, at best. In Greek myth, the lord of the seas is Poseidon who is not really that watery of a deity as he is most noted for being the god of earthquakes. In many myths, water is simply the primal life force that all life emerges and eventually the depths of where all life returns. In essence, the sea reflects the cycles of time and is a close cousin to the introverted earthy realms. Yet, whereas earth is structured and firm, water is elusive and mysterious and filled with monsters and creatures that have terrified people for aeons. However, behind that monster (which often reflects an inner monster) is the buried treasure that holds the secrets to our individuality. Water is our connection to the instincts. It connects us to the primal world of the animal kingdom, which despite our modern airy attempts (see above) to rationalize and civilize society, we are part of. It joins us to our family and our roots, our heritage and our patriotism, and our urge to protect and sustain. The element of water connects us to the similarities of man rather than the differences, and through this experience we experience compassion, understanding, and unconditional love. Water does have its weak points. Our urge to be part of a group and feel bound to other individuals, not only through our need for community and our binding connection through our DNA, often minimizes our need to be individual as a unique. Those with a strong emphasis of water, often have difficulties expressing their own opinions, and instead opt to repeat arching collective idealisms that are not truly their own. Although water signs often have strong values and loyalties, those values are often based on societal and familial allegiances rather than the true essence of their individual nature. For water to experience wholeness, it is necessary for them to leave the “pack” long enough for them to experience what they truly believe themselves and add those beliefs to society, rather than allow society to dictate and often dominate their lives. In our next lesson, we will add modalities to our understanding of the astrological signs and then put it all together to give you a profile of your temperament. However, we will explore the elements more deeply as we begin to move through each astrological sign. Please feel free to leave any questions or comments in the section below. If you are confused by anything or need further clarity, I am here to assist you. This entry was posted in astrology and tagged Air, astrology, Earth, Feeling, Fire, Intuition, Jung, Psychology, Sensation, Thinking, Water on July 25, 2018 by Storm Cestavani. In our last lesson we learned about the astrological planets and now is time that we move on to the second ingredient to prepare for interpretation which is the astrological signs. Additionally, everyone can get a copy of their horoscope which you can get for free on my website. If you do not understand the chart, you can always check out the tutorial that I created to help you understand your horoscope. The section on the Astrological Signs will be divided into 4 parts. Part 1: Gender – Do signs have sexes? Part 2: Element – What are the astrological elements? Part 3: Orientation – What are the three astrological orientations? So, grab your coffee, tea, or a nice beverage and get ready because there is a lot to cover. I would suggest reading over these sections slowly as we begin to add layers and nuance to your astrological knowledge. This entry was posted in astrology and tagged astrology, Extrovert, Feminine, Introvert, Jung, Masculine, Psychology on July 25, 2018 by Storm Cestavani.